An advantage of this private charter to Bryce Canyon and Zion national parks is that it gives you the opportunity to see two national parks at one time. The journey begins as we lift off and fly over the world-famous Las Vegas Strip and then to our first point of interest, Zion National Park. Zion National Park is located in southwestern Utah near the town of Springdale. 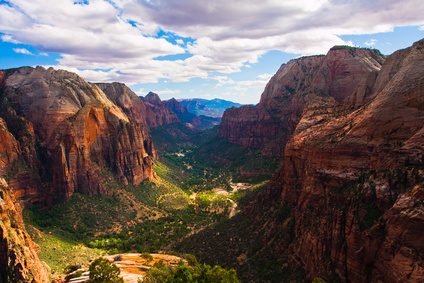 A prominent feature of the 229 square mile park is Zion Canyon. The canyon is 15 miles long and up to a half mile deep. It was formed by the north fork of the Virgin River cutting through the reddish and tan Navaho sandstone. You will see stark cliffs rising out of the canyon floor and walls of rock formations sculpted by the wind. After this spectacular flyover of Zion National Park, it's off to Bryce Canyon National Park. Bryce Canyon National Park is named after Ebenezer Bryce who came to this area to harvest the lumber in 1875. The area was dedicated as Bryce Canyon Monument in 1923 by President Warren G. Harding and became a national park in 1928. Bryce Canyon National Park is a series of huge natural amphitheaters carved out of the sedimentary rocks by the Paria River and its tributaries. Differential erosion has produced a fantastic array of bright colored pinnacles, window walls, pedestals, fins and spires. The pinnacles or “ hoodoos” were all created by this type of erosion. Some of the different “hoodoos” you will see are: Thor’s Hammer, Sinking Ship, White Cliffs, The Hunter and The Poodle. For the nature lovers, there are over 400 species of birds and animals in the park ranging from small mammals to black bears, mountain lions, deer and elk. This is a charter adventure that is sure to be a wonderful memory.